Happy weekend! Well, the weekend's almost over and tomorrow (Monday) most of us would be going to work/school. But before the weekdays say hello, let me share with you what I wore yesterday when we went to church. Yup, we attended the anticipated mass yesterday because we would love to have the whole Sunday to ourselves and just sit back, relax, watch a good movie and bum out the whole day at home. As you all know, my old clothes are starting to fit me again; however, because our gym hasn't been doing its aero-taebo class, my weight isn't moving. Well, at least I'm not gaining any pounds; but I'm not losing 'em either. Well, it's because the aero-taebo class in our gym has to have a minimum of 5 participants and because it's been raining pretty hard these past few days, I guess my aero-taebo classmates aren't very thrilled to lose weight and work out either. So it's pure cardio for me and I tried one machine wherein it looks and feels like I'm lifting weights because I so wanna lose the fats on my arm. However, I'm quite scared about getting muscular on my arm area. Well, I have nothing against women body builders; but it's just that it's not for me. I don't think I would look good with a pair of muscular arms. 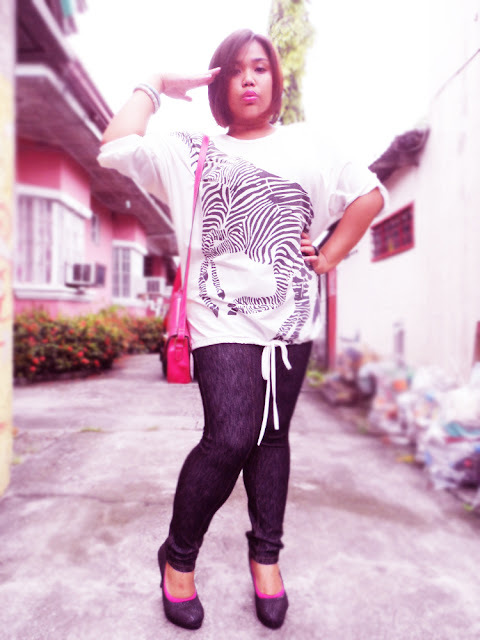 Anyway, here's what I wore yesterday: A White Zebra Print Top I got from a bazaar; My Get Laud Jeggings; Black Pumps; Pink Shoulder Bag from Hyphen Curiosities; Floral Bracelets; Ring from Hyphen Curiosities. Well I would want to apologize because after taking the full body shots, my camera's battery died, so I wasn't able to get a close-up shot of my bag, shoes and accessories. After going to the church, we went grocery shopping and I bought something, which I would be reviewing this week. So better stay tuned in this blog for another makeup review. I know you've been wanting more product reviews; but I might make more of FOTD posts for now because I'm on a tight budget. My sister's birthday is coming and my birthday's coming and I'm hoping I could do something special on my birthday. So, if anyone wants to sponsor some products for review, you're free to contact me. Hahahahaha! I'm not fond of always approaching brands to sponsor me unless I really do use, have bought and loved their products. If I have genuinely been a big fan of the brand, that's when I ask for sponsorship or giveaway stuff on special occasions like my Blog Anniversary. #FACT. I don't just randomly message brands to sponsor me if I don't use their products at all; unless they're the ones who would be approaching me. So, there's a little fact for you. That's why the products I review are coming from my own money or have been given to me wholeheartedly by the brands. So, there! Cute shoes you have! Hey, black pumps? Ano yung pink? So cute! Super pretty with this outfit, Gel!! >:D< Love it!!! ♥ See you soon!